Authentic Blogger (FB group page), in conjunction with our sister blog, The Authentic Blogger is proud to announce this month's recipient of our Monthly Featured Blog Author Award! **Go to the Authentic Blogger Discussion Board to access the criteria for being chosen as the next recipient of this award. Duane Scott & Dawn S.
If you have been chosen as an Authentic Blogger Monthly Featured Blog Author, please grab the button below to post on your blog! Congratulations again! Thank you for the nod of recognition to both Authentic Blogger and Healing Morning! Marty & I appreciate the attention given to AB and I am equally flattered about the spotlight on Healing Morning. I'll check w/ Marty & see what we can come with with together to address the list of requirements - it should be fun! I'll also get to the same w/ Healing Morning & post later in the week. If you wish to participate, simply list 10 things that make you happy and pass on the award to 10 other blogs (or vlogs) that you like. Thanks & hugs. I so appreciate Dawn and Marty and Authentic Blogger. This has been a tough month for me, capped off by a layoff notice and an uncertain future. To know that my work, my writing, is appreciated is sufficient to lift my spirits and restore my enthusiasm. I especially appreciate the chance to hear from new readers, to share inspiration and encouragement. This is a good work and I am blessed to be a part of it. Sharon, you are very deserving of this recognition. Thank you, in return, for the kind words about the dedicated work that Marty & I put into the AB community. It is out of love that we both do it, but it's also nice to hear that our efforts are noticed and appreciated! I dont expect you guys to spend your blogging time filling out these requirements, tandem them up with another, but here is the award none-the-less! Salutations friend! You are now the proud winner of the Best Blog Award! It is my pleasure to pass it along to you! You may come to my blog Artisan of the Human Spirit to pick up the emblem and do what you have to do! I recognize your efforts and skill and wanted to give you a well deserved atta-boy or atta-girl! Enjoy and congrats! 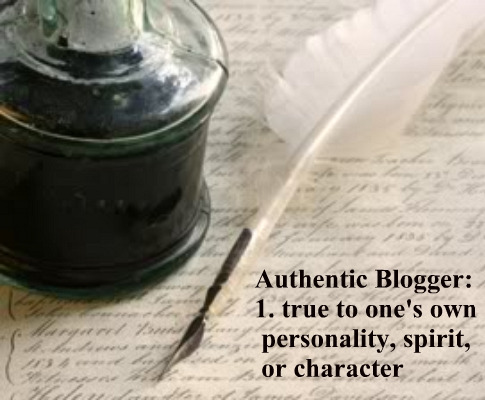 Congratulations to all of the success of the featured bloggers and Authentic Blogger. I have been graced with an award I would like to share. You can pick it up at my blog. Keep up the great work. We'll be happy to get your blog posted on our wall! Tell all your bloggy friends about AB blog and FB group - we're always happy to spread the word! I am very happy to be included in this group! Thanks a million! Molly, we're happy to welcome you to the AB family! Tell all your bloggy friends about us and keep writing! Thank you for posting about this blog! Anahid, you're very welcome! You're one of those special lights in the blogging world, and the AB community. Enjoy your month as featured blog author! You are both doing a wonderful job! Keep up the great inspiring work! I wish you happiness and continued success! I enjoyed looking over your blog. I found your profile on another blog I follow and I added myself to follow you. You are more than welcome to visit my blog and become a follower if you want to. Thanks is a small word to express my gratitude, Dawn and Marty. I am honored and deeply touched that you decided to shine the group's light on my little space in the world wide web. My most humbled thanks to you for Showcasing my wee blog! I posted a blog about it this morning. Thanks again! I am totally honored! I find you r blog very authentic, interesting an d engaging. I am your follower.Please do visit my blog too when you have the time.